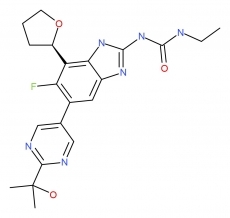 The novel aminobenzimidazole, VXc-486, which targets gyrase B, potently inhibits multiple drug-sensitive isolates and drug-resistant isolates of Mycobacterium tuberculosis in vitro (MICs of 0.03 to 0.30 ug/ml and 0.08 to 5.48 ug/ml, respectively) and reduces mycobacterial burdens in lungs of infected mice in vivo. VXc-486 is active against drug-resistant isolates, has bactericidal activity, and kills intracellular and dormant M. tuberculosis bacteria in a low-oxygen environment. Furthermore, VXc-486 inhibits the growth of multiple strains of M.abscessus, M. avium complex, and M. kansasii (MICs of 0.1 to 2.0 ug/ml), as well as that of several strains of Nocardia spp. (MICs of 0.1 to 1.0 ug/ml). A direct comparison of the parent compound VXc-486 and a phosphate prodrug of VXc-486 and showed that the prodrug of VXc-486 had more potent killing of M. tuberculosis than did VXc-486 in vivo. In combination with other antimycobacterial drugs, the prodrug of VXc-486 sterilized M. tuberculosis infection when combined with rifapentine-pyrazinamide and bedaquiline-pyrazinamide in a relapse infection study in mice. These findings warrant further development of the prodrug of VXc-486 for the treatment of tuberculosis and nontuberculosis mycobacterial infections. In addition, a high throughput screen was conducted using virulent Mtb-infected macrophages. Hit compounds had 50% inhibitory concentration (IC50) potency ranges from 0.05 to 20 ug/mL. Target identification efforts are underway.